It wasn’t until 1988 when Roubideaux went to her first Association of American Indian Physicians meeting as a medical student that she first met American Indian physicians. The meeting helped strengthen her career focus. Roubideaux, M.D., M.P.H., a member of the Rosebud Sioux Tribe, has made it her life’s mission to ensure other young people don’t have to wait as long to see physicians who are from their own communities and can get better access to quality health care. “Underserved communities of all kinds need doctors who are from there, who understand what needs to improve, and who are willing to practice medicine there because of the relationships they already have from growing up there,” Roubideaux said. She is using that knowledge to create stronger physician career pathways to and from rural and underserved communities and WSU’s health sciences campus, and hopes also to help increase the number of physicians trained to practice in those areas. Being a part of the team developing the new College of Medicine in Spokane is the next step in her own career pathway. Roubideaux is the associate dean for Diversity, Inclusion and Leadership and a clinical professor in the Elson S. Floyd College of Medicine. Prior to this position she served as senior advisor to the Secretary for American Indians and Alaska Natives and as the director of the Indian Health Service (IHS) in the U.S. Department of Health and Human Services in President Barack Obama’s administration. The first American Indian woman to head the IHS, Roubideaux earned all three of her degrees from Harvard and completed her medical residency at Brigham and Women’s Hospital in Boston. She then joined the IHS in Arizona in the 1990s as a clinician and administrator, spending three years on the San Carlos Apache Indian reservation and one year on the Gila River Indian reservation. After 11 years in academics, she was asked to join the Obama Administration. As director of the IHS, she worked with the administration and Congress to increase resources for the agency, and worked with employees to make significant improvements in business practices and delivery of care. Still, the shortage of primary care physicians was a significant and growing challenge for the more than 600 hospitals, clinics and health stations located mostly on or near Tribal communities that she oversaw. In Washington, 19 of 39 counties are severely underserved by physicians (10.4 or fewer doctors per 10,000 residents). On the contrary, nearly half of all physicians are located in King County alone, greatly exceeding its 29 percent population share. 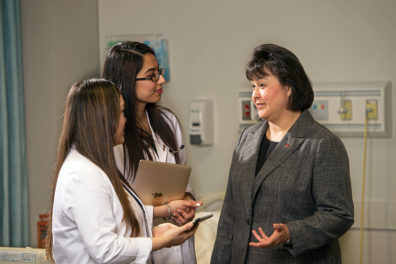 Roubideaux hopes to change that by partnering with K–12 schools, community colleges, tribal colleges, universities, health facilities and community leadership in underserved areas to better prepare students for a medical school education. She has already met with some K–12 leaders in the state and learned that they are looking for more tools for teachers and advisors on the physician career pathway and a stronger link from the current STEM (Science Technology Engineering Mathematics) emphasis in high schools to medical careers. And she is making herself and other College of Medicine faculty available to talk to students at schools, to present and meet with civic organizations in both rural and urban underserved communities, and to explore partnerships to strengthen the physician career pathway. In fact, Roubideaux is reminded often of her high school days and why she decided to become a doctor. Just as she felt compelled to be a resource for her community, she’s helping young people today realize that they can be a solution for health needs in their communities.